The Spike Island Cross Country challenges returns on Saturday 28th April, with boats in at 4pm and 5pm and returns at 7.30pm and 8pm. The fantastic 6km course includes roadways, the outer island and around the Forts Moat, with a mix of paths and occasional short grass. Each finisher will get a unique Spike island medal and water / fruit, having run the most unique course in Ireland. Visitors on the first 4pm boat have the option of a guided tour to the Fortress, and all visitors will get to enjoy the breathtaking views that make Spike Island and Cork harbour famous. 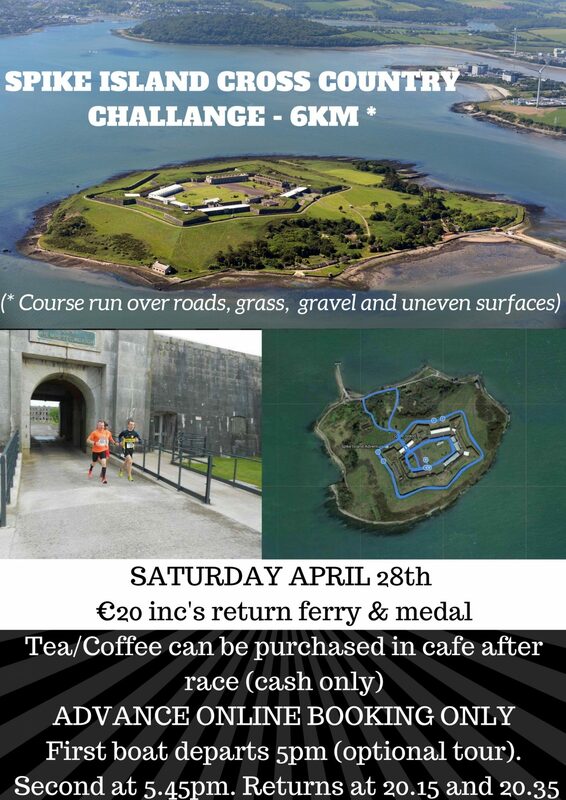 Price of €20 includes return ferry, race entry, medal, water and fruit for finishers.